What better way to finish a busy week for the band than the Nuffield College garden party? We were very pleased to be invited back to Nuffield Place this year. Luckily the weather was fine again, though it was good to have the gazebo, just in case. 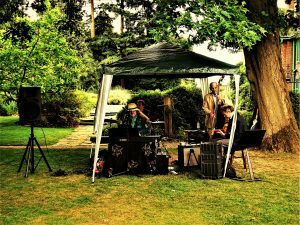 We’d played at the Madhatter jazz club in Oxford, then at a funeral in Amersham for a longstanding fan of the band, and then on Saturday we were in Gloucestershire for a private party. So by Sunday we were in the mood for some relaxed swing and sunny bossa novas.